We demand justice for Sakine, Fidan and Leyla! On 9 January 2013 an atrocious crime was committed in the center of Paris which has deeply shaken all Kurdish women’s organizations and the Kurdish people, international women’s organizations, women in many different countries as well as friends of the Kurdish people, progressive forces and the democratic public. Three Kurdish women politicians and fighters for freedom and women’s liberation – Sakine Cansız, Fidan Dogan and Leyla Şaylemez – were brutally and dastardly murdered. For the Kurdish people and especially for us as women the clarification and elucidation of this political crime is a very important and sensitive issue as well as the identification of the actual perpetrators of this massacre and any involved force. As long as the French justice system has not only exposed the killer pulling the trigger but also all dark forces and states that are involved in this political assassination, the French government cannot secure itself from being under a cloud. As this triple murder took place in a Kurdish institution that has been observed by the French secret service 24 hours per day, the French Ministry of the Interior and Ministry of Justice carry the responsibility to clarify completely, how such an act could happen. This cruel crime in central Paris concerns all people fighting for freedom, justice, women’s rights and democracy. Women, peoples and progressive political forces from all over the world have called for an immediate clarification of the killings. Ceni – Kurdish Women’s Office for Peace calls upon the French government with the demand: “We want justice for Sakine, Fidan and Leyla!” Until this crime has been solved and enlightened we will keep on sending letters, faxes, e-mails and postcards with our demands to the French prime minister, the Minister of the Interior and Minister of Justice. We call on all democratic institutions, political parties and individuals; feminist groups and women’s rights defenders; internationalists, Kurdish women and the Kurdish people to participate in this campaign by sending, letters, faxes, e-mails and postcards requirements as outlined below (preferably in French) to the representatives of the French Government. Postcards can be ordered at our office. Please, indicate the number of cards and your postal address. For further and recent information please see also the Statement of Feyka France and the information file attached. 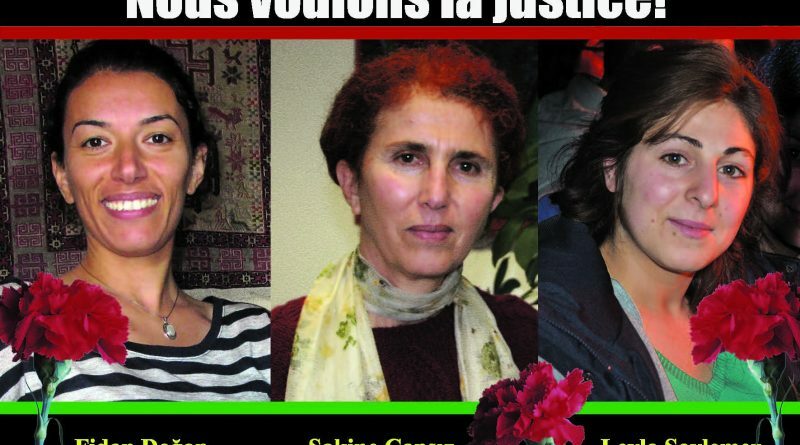 On 9 January 2013, three Kurdish politicians and fighters for women’s rights, Sakine Cansiz, Fidan Dogan and Leyla Soylemez, were callously and maliciously murdered in the centre of Paris. It is your responsibility to conduct a full-scale investigation into these political killings and bring the perpetrators to justice. To identify those responsible for the murders and bring them to justice! To uncover and condemn those persons and state forces who are complicit in this crime! To stop the politically motivated criminalisation of Kurdish associations and the arrest of Kurdish political activists in France! Le 9 janvier 2013, trois politiciennes kurdes, Sakine CANSIZ, Fidan DOGAN et Leyla SAYLEMEZ ont été exécutées dans les locaux du Centre d’Information du Kurdistan (CIK), situé en plein centre de Paris. Vous avez le devoir immédiat de faire lumière sur ces assassinats et de juger les coupables. La condamnation immédiate des assassins et responsables de ce crime politique! La lumière sur les forces obscures et les Etats qui se cachent derrière ce massacre! Fin aux arrestations et aux pressions faîtes aux politiciens et aux associations kurdes! L’abandon par la France de sa politique anti-kurde et le retrait du PKK (Parti des Travailleurs du Kurdistan) de la liste des organisations terroristes. ← For sovereignty and trade to serve the people! End trade liberalization! Junk WTO!